It finally happened. 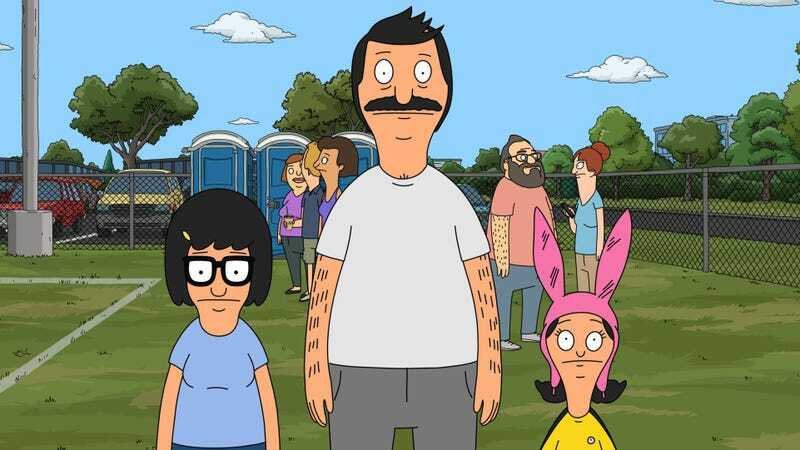 The Bob’s Burgers/Home Movies crossover fans have been waiting for aired tonight (sort of). While the characters aren’t explicitly from the late 90s series created by Loren Bouchard starring H. Jon Benjamin, some familiar faces and voices found their way into “The Hurt Soccer.” Melissa Bardin Galsky guests as Mara, who looks an awful lot like Melissa from Home Movies, while a soccer game is run by a Coach McGuirk doppleganger and a ringer for Brendon Small (the animated character, not the real man) is seen waiting in line for a porta potty. All of this would have been enough on its own for a charming half-hour of television, but throw in classic Belcher family dynamics plus some amazing musical numbers and you have a damn near perfect episode of Bob’s Burgers. Louise and Bob, though different in demeanor, have very similar values at heart. They seem to prioritize their own needs and wants over everyone else, but in the end will always put aside selfishness to root for the underdog and bring down a bully. That’s what happens when Louise is forced to participate in the final soccer game for the Gold Dragons after some confusion over sarcasm leads to Bob and Linda signing her up for the team. Bob in turn is asked to coach the monumental game with no knowledge of what the turf is even called (“Field? Like a farm?”). At the start they both want to end things as quickly as possible and get home for the Supreme Extreme Champions marathon. But another shared trait eventually kicks into gear: a competitive spirit. With just a couple of John Grisham novels standing between her and the other team, Louise steps up to guard the goal for the other girls on her team who just want to play a full game of soccer. Back at the restaurant Gene and Linda find themselves in charge and decide to follow a never-before-mentioned life-long dream and turn the burger joint into a piano bar. This brings back the dynamic that was introduced in season one’s “Hamburger Dinner Theater” with Gene and Linda embracing their dramatic instincts and love for performance, this time without judgment from Bob. And when music teacher Ms. Merkin comes in, things really pick up with real-life drama surrounding the community theater production of TSA: The Musical. 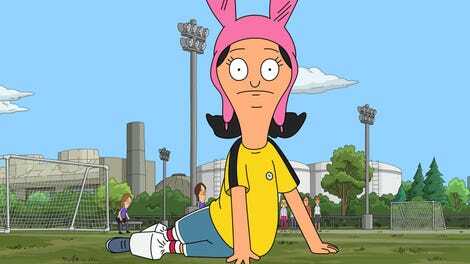 While this storyline is overall less compelling than Bob, Louise, and Tina’s time on the soccer field, it more than makes up for that by introducing some of the most well-crafted and creative songs of the series. This was the perfect point in the season for the show’s writers to remind us that they do original music like no other show on television. This week the one-liners were delivered more sparingly, but there were still non-stop laughs within a much more satisfying story than previous weeks. In the end Gene and Linda set the restaurant on fire, and Bob and Louise run into the smoke to finally catch their television marathon while Tina is happy to have found a sense of self as an assistant soccer coach standing up to the opposing team’s leader. Where Coach McGuirk, Melissa, and Brendan ended up is unknown, but here’s hoping this isn’t the last nod to Home Movies we see in the Bob’s Burgers universe.